(Nanowerk News) Sandia National Laboratories researchers have made the first measurements of thermoelectric behavior by a nanoporous metal-organic framework (MOF), a development that could lead to an entirely new class of materials for such applications as cooling computer chips and cameras and energy harvesting. The results were published in “Thin Film Thermoelectric Metal–Organic Framework with High Seebeck Coefficient and Low Thermal Conductivity”, which appeared in Advanced Materials. This work builds on previous research in which the Sandia team realized electrical conductivity in MOFs by infiltrating the pores with a molecule known as tetracyanoquinodimethane, or TCNQ, as described in a 2014 article in Science. 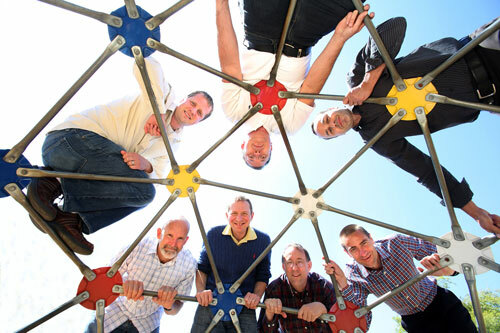 This playground structure represents a larger-than-life nanoporous metal-organic framework to this Sandia National Laboratories research team of (clockwise from upper left) Michael Foster, Vitalie Stavila, Catalin Spataru, François Léonard, Mark Allendorf, Alec Talin and Reese Jones. The team made the first measurements of thermoelectric behavior in a MOF. The researchers had to devise a method to measure the thermoelectric properties of [email protected], where TCNQ was the guest molecule. MOFs are so new — they were only discovered in 1999 — that researchers often find themselves on the frontier of science with few established tools or even a clear understanding of the material’s fundamental properties. Léonard, Talin and Kristopher Erickson, a former Sandia postdoctoral fellow, created a thermoelectric device by connecting Peltier heaters and coolers to each end of a thin film of [email protected] to generate a tiny temperature gradient. They accurately measured the temperature gradient with an infrared camera while simultaneously measuring the generated voltage. From these data they obtained the voltage per unit of temperature change, known as the Seebeck coefficient. The resulting measurements showed great promise. [email protected] has a high Seebeck coefficient and low thermal conductivity, two important properties for efficient thermoelectricity. The Seebeck coefficient was in the same range as bismuth telluride, one of the top solid state thermoelectric materials. The measurements also captured data that has advanced the team’s fundamental understanding of the [email protected] electronic structure. Sandia physicist Catalin Spataru and materials scientist Mike Foster conducted detailed electronic structure calculations of [email protected] and Sandia materials scientist Reese Jones performed thermal conductivity simulations. “We were trying to understand the role of the guest molecule, TCNQ in this case, when it infiltrates the pore of a MOF. Finding a representative configuration for the combined [email protected] system via computer simulations was particularly challenging, as we don’t expect guest molecules to form an ordered structure,” said Spataru. The simulations allowed the researchers to verify the source of the charge transport and establish that [email protected] is a p-type material. Applications such as transistors and diodes require semiconductors of both p-type and n-type. The researchers are now improving the thermoelectric efficiency of [email protected] One avenue is to change the MOF films from the polycrystalline structures used in the initial research to single-crystal.